The Aman is a well-known hotel brand around the world, and many Aman fans are keen to try out the hotel chain in whatever country they find themselves next. 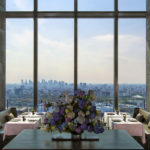 The Aman Tokyo is the most recent luxury hotel to open in Tokyo, and has the brand’s signature, monochrome, simplistic look in every aspect of its design.Located on the top 6 floors of the Otemachi Tower, it offers panoramic views of Tokyo’s skyline, with 84 rooms and suites overlooking the Imperial palace and Tokyo bay. 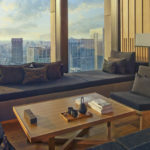 The Aman Tokyo Spa and wellness programmes offer the chance to relax and re-energise in calm surroundings with fantastic views. 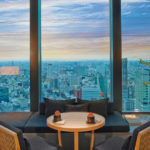 Its central location means you have easy access to most attractions, one of the nearest being the Tsukiji Fish Market which you can visit early in the morning to experience the hustle of the fish vendors.